If you have never felt any kind of tooth ache or sensitivity, then you are very lucky! You also probably deserve complements on your regular oral hygiene practice and regular dental visits. Tooth problems can range from minor sensitivity, to minor ache, to severe unbearable pain. Pain is generally, a cautionary response of the body and an indication that something is wrong somewhere in the system. The exact source of toothache is difficult to pinpoint straightaway. It can quite often be in response to other stimulisuch as hot or cold foods. Tooth decay is the most common cause of toothache. 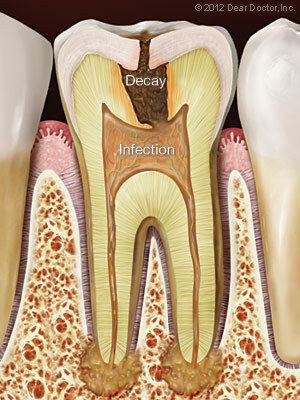 Bacterial infection from the teeth cavities can then spread to inner parts of the tooth, and even into the gum tissue. Accidental physical damage and gum disease can also result in tooth pain. What Else Can Cause Toothache? The only way to determine the cause of toothache exactly is to see the dentist. He will make a thorough examination, ask questions, and make diagnostic tests like x-rays etc. However, some symptoms can be used to make a first guess about the source of the pain. Continuous severe pain- Continuous severe pain and pressure, swelling of the gums, and sensitivity to light touch point to an infection in the tooth which may possibly be accompanied by an abscess (pus-filled region) in the surrounding bone and gum tissue. In such cases, it’s important to see a dentist or endodontist immediately— not only to seek relief from the pain, but more importantly, to save the tooth being lost. Treatment may include a root canal procedure to remove the diseased or dying pulp inside, possibly accompanied with other periodontal procedures to drain the abscess and control the infection. Lingering pain- Lingering pain after eating hot or cold foods will normally indicatea disease in the pulp tissue inside the tooth root. 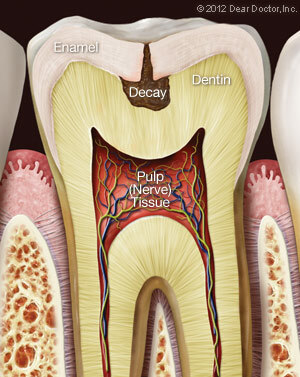 Either a deep decay or physical trauma to the tooth enamelmight have allowed bacteria to infect the pulp tissue and compromise the pulp vitality. Pain may go as nerves in the pulp tissue die away, the, but the infection will not, unless treated. As a matter of fact it can spread around and cause serious damage. Immediately make an appointment with a dental professional for treatment. A root canal procedure may be needed to ease the pain and save the tooth. Sharp pain- Sharp pain when biting on foods can be caused by a loose filling, severe tooth decay, a cracked tooth, or possibly by diseased pulp tissue inside the tooth root. The dentist will have to make tests to determine the exact cause. Depending on the results of investigation, treatment, a filling, bonding, root canal treatment, or other procedures may have to be carried out. Momentary toothache-Momentary or occasional pain due to sensitivity to hot or cold foods may be caused by a tiny spot of decay or a loose filling.It could also be caused by a little exposure of the tooth root due to gum recession.Try changing to a soft brush and tooth pastes specially prepared for sensitive teeth. If that does not help in a few weeks, seek an appointment with the dentist.Some types of dental treatment (like teeth whitening)may alsocause temporary sensitivity. This can often be relieved by the same treatment methods. However, if the pain persists or grows even worse, be sure to seek professional help. Dull ache- Sinus infections or congestion from colds or flu may also cause symptoms such as a dull ache or pressure in the upper jaw or some teeth. When the illness has gone away after treatment the discomfort also goes away. Tooth clenching or grinding habits (bruxism) is also known to cause this type of discomfort. In case of bruxism you should get a night-guard made at the dental office. Regardless of what type of tooth discomfort you are feeling, if it does not go away with the above initial suggestions, is necessary to seek professional treatment.